Brentford striker Scott Hogan sealed a dramatic late point as they came from behind to draw with Bristol City. Lee Tomlin gave the visitors the lead when he ran unchallenged into the box and fired low past keeper David Button. Visiting keeper Richard O'Donnell saved Hogan's spot kick after he was fouled by Nathan Baker to keep their lead. Hogan scored his first goal since his return from a year out with a cruciate knee ligament injury as he nodded Jake Bidwell's tee up to rescue a point. The result means Brentford remain in 13th place in the Championship table while Bristol City climb a place to 18th and maintain their 10-point cushion on the relegation places with four games left to play. Bristol City were chasing what would have been a first league victory at Griffin Park since February 2006, before Hogan's late intervention. The former Rochdale striker injured his knee in Brentford's 2-0 win against Rotherham in August 2014 and scored his first goal for the Bees almost two years after joining the club. Brentford head coach Dean Smith: "I spoke to my guys on the bench and said as [Hogan] stepped up that at least the keeper wouldn't have seen him take one, but it was a great save. "Scott is a natural striker and they know where to be when it matters. He's had a round of applause from the boys after the game because he's worked so hard for that, and has come back even stronger. "A re-rupture isn't nice at all so that goal was for him, his family and the medical team. "He's a lot stronger player than I saw at Rochdale, he's a natural finisher and that's why the club went and got him. I certainly couldn't have afforded him at Walsall." Bristol City head coach Lee Johnson: "I would say it's advantage Bristol City in that fight, but we want to try to catch Brentford because that's important for our mindset going forward. "This was a good game for the neutrals with quite a few opportunities at both ends, major decisions that both teams feel didn't go their way, but it was a fair result in the end." "Lee [Tomlin] is a top player and one of those who you don't see for 89 minutes until he sticks one in top corner. He's a Premier League talent like Alan Judge for Brentford and we're lucky to have him." Match ends, Brentford 1, Bristol City 1. Second Half ends, Brentford 1, Bristol City 1. Luke Freeman (Bristol City) wins a free kick in the defensive half. Alan McCormack (Brentford) is shown the yellow card. Goal! Brentford 1, Bristol City 1. Scott Hogan (Brentford) header from the centre of the box to the bottom right corner. Assisted by Jake Bidwell with a headed pass. Offside, Bristol City. Peter Odemwingie tries a through ball, but Jonathan Kodjia is caught offside. Corner, Brentford. Conceded by Marlon Pack. Corner, Brentford. Conceded by Joe Bryan. Corner, Brentford. Conceded by Richard O'Donnell. Penalty saved! 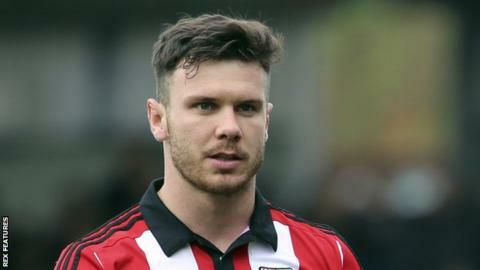 Scott Hogan (Brentford) fails to capitalise on this great opportunity, right footed shot saved in the bottom left corner. Penalty Brentford. Scott Hogan draws a foul in the penalty area. Penalty conceded by Nathan Baker (Bristol City) after a foul in the penalty area. Substitution, Brentford. Josh Clarke replaces Sergi Canos. Substitution, Bristol City. Luke Ayling replaces Adam Matthews. Offside, Brentford. Harlee Dean tries a through ball, but Scott Hogan is caught offside. Attempt saved. Lasse Vibe (Brentford) header from the centre of the box is saved in the top left corner. Assisted by Maxime Colin with a cross. Attempt missed. Alan McCormack (Brentford) right footed shot from outside the box misses to the right. Substitution, Brentford. Konstantin Kerschbaumer replaces Ryan Woods. Substitution, Brentford. Scott Hogan replaces Sam Saunders. Attempt blocked. Yoann Barbet (Brentford) left footed shot from outside the box is blocked. Assisted by Harlee Dean with a headed pass. Joe Bryan (Bristol City) is shown the yellow card for a bad foul. Sam Saunders (Brentford) wins a free kick on the right wing. Foul by Nico Yennaris (Brentford). Corner, Bristol City. Conceded by Maxime Colin. Attempt blocked. Bobby Reid (Bristol City) right footed shot from outside the box is blocked. Jonathan Kodjia (Bristol City) wins a free kick on the left wing. Offside, Bristol City. Nathan Baker tries a through ball, but Jonathan Kodjia is caught offside. Attempt missed. Sam Saunders (Brentford) right footed shot from outside the box is too high. Assisted by Sergi Canos. Substitution, Bristol City. Peter Odemwingie replaces Lee Tomlin. Corner, Bristol City. Conceded by Yoann Barbet. Attempt missed. Lasse Vibe (Brentford) right footed shot from the right side of the box misses to the left. Foul by Ryan Woods (Brentford).